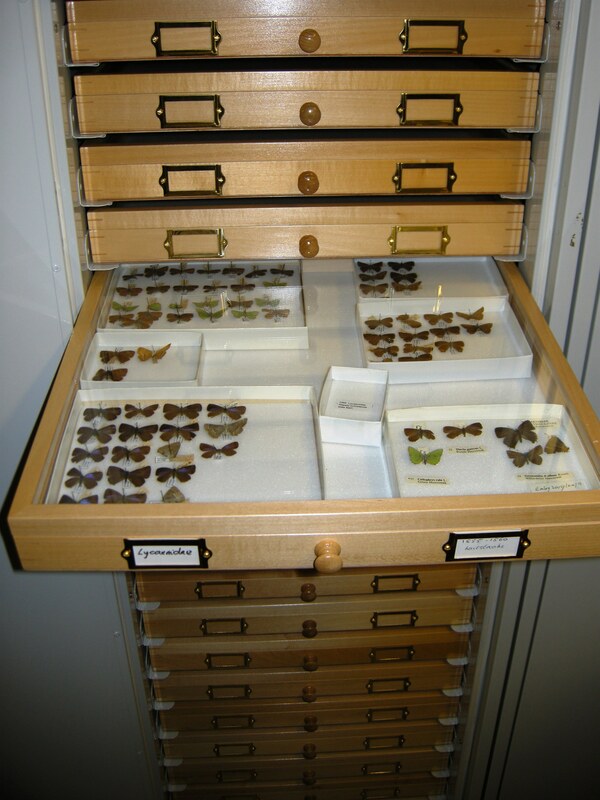 In 2013 the Potteries Museum & Art Gallery, Stoke-on-Trent Museums (PMAG) were awarded an Arts Council England PRISM Fund grant for the purchase of 4 dedicated insect storage units containing a total of 80 glass-topped entomological drawers to provide conservation quality enclosures for a collection of moths and butterflies, part of Designated Natural History collections held at PMAG. The cabinets and drawers were purchased from Preservation Equipment Ltd. The 4 insect cabinets installed in biology store. Work has started on the long-term task of transferring a collection of c.8000 specimens amassed by the former Staffordshire Lepidoptera Recorder, Richard G. Warren. It is an amazing resource waiting to be utilized. Over a period of 40 years up until the late 1990s Warren collected specimens locally in this County that is pivotal in the north / south distribution of species. The data associated with these specimens is significant in plotting the distribution of Lepidoptera nationally. Using volunteer and core staff, the Warren collection is now being systematically moved into the new cabinets and drawers that are housed in the dedicated and environmentally controlled biology store within PMAG. 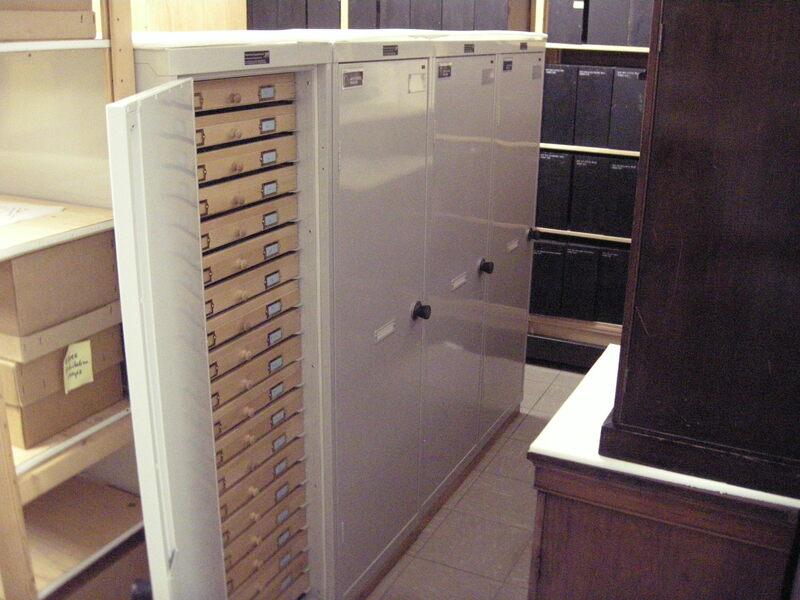 The ultimate aim is for each species to be in individual Plastazote-lined card trays within the drawers. They are arranged according the Bradley & Fletcher 1986 indexed list of British butterflies and moths. Already work experience and volunteer students from the Staffordshire University MSc. course in Ecology and Conservation are involved in collection cataloguing and management to extend their taxonomic knowledge. Lycaenidae being arranged in the new drawers. The new storage will facilitate the long term preservation of the specimens, allow access to specimens and the data associated with them. It will standardise access and we hope to continue this approach to other collections in the future to eliminate a backlog of collections held in user unfriendly hinged wooden storage boxes. Data associated with specimens is being recorded electronically for the first time. This information will be batched in suitable units and sent to the Staffordshire Ecological Record which records and publishes species data in map form to a dedicated website and passes the data onwards to the National Biodiversity Network (NBN). 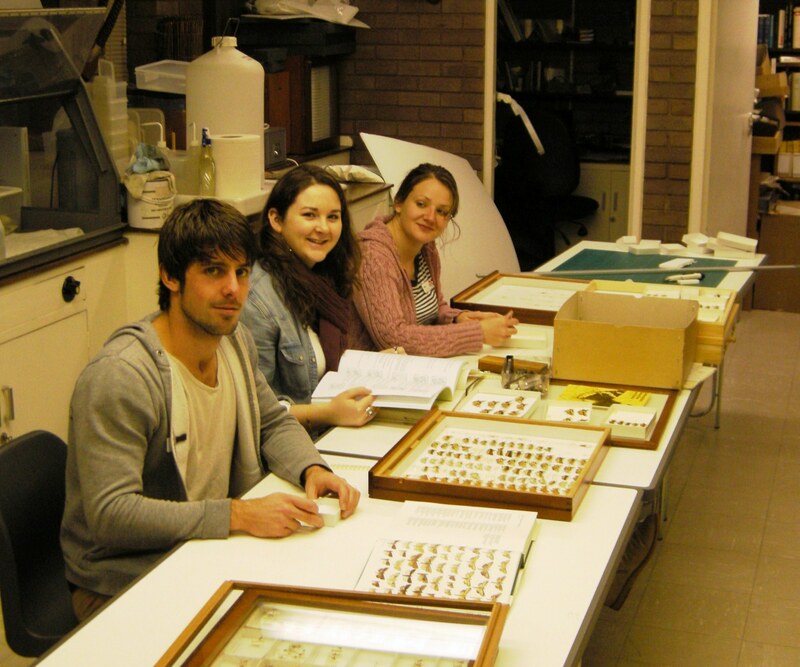 Mark Ashby, Joanne O’Keeffe and Lindsay Selmes, Staffordshire University MSc student volunteers sorting lepidoptera.